Facebook in Australia has put together a number of lists to help monitor Australian politicians and parties and what they're posting on the social platform. When you open each one, click Follow to subscribe to them. You can then access the lists from your Interests section, towards the bottom of the Left sidebar. Facebook has also published more tips for journalists on using their platform and Instagram in the 2013 Federal Election. Read it here or below. Happy to admit I spend way too much time on the internet. Buzzfeed, yeah, I'm looking at you. Damn you and your "40 ways to..."
But when I'm using the internet as a news tool, what becomes key is tailoring your browser to be your partner in social sleuthing: tipping you off to new leads, checking if things add up, and ideally, not crashing regularly. At a recent training session, after I'd demo'ed best practice for building a high octane browser (points for using a motorsport reference), I was asked to shed some light on what I use and at work and home. The first thing I install on any machine when I use it. Google's browser wins hands down in the newsroom for many reasons: it's fast, using your Google logon is a boon for staff that hot-desk, but the greatest advantage lies in the extensions and apps a user can add to really build a powerful workspace for monitoring and working with social content. Here's what I've added to my browser, which using the Google logon I just mentioned, means I have the same tools at my disposal at home and at work. In a March blog post, Tweetdeck (owned by Twitter) made it clear where their development priorities lie. "We think these web and Chrome apps provide the best TweetDeck experience yet, and that they are the apps in which you’ll want to see us add new capabilities first, followed closely by our Mac and PC apps." In fact, features are updated so quickly that I was caught out by new tricks each day of the two day training. Tweetdeck in my mind is unrivalled as a tool for monitoring Twitter: real time updating, a powerful search tool, and easily moveable columns make it the perfect tool for journalists and producers monitoring a number of different stories across the day. Here's my current layout, working across from left to right. A list of compiled of global breaking news accounts. 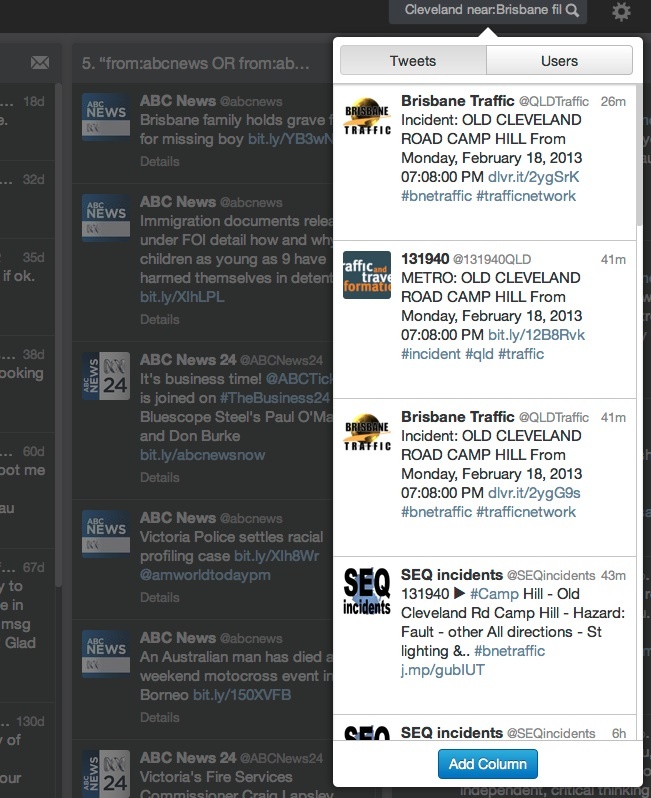 from:abcnews OR from:abcnews24 OR from:breakfastnews - a search pulling together tweets from our main news accounts. 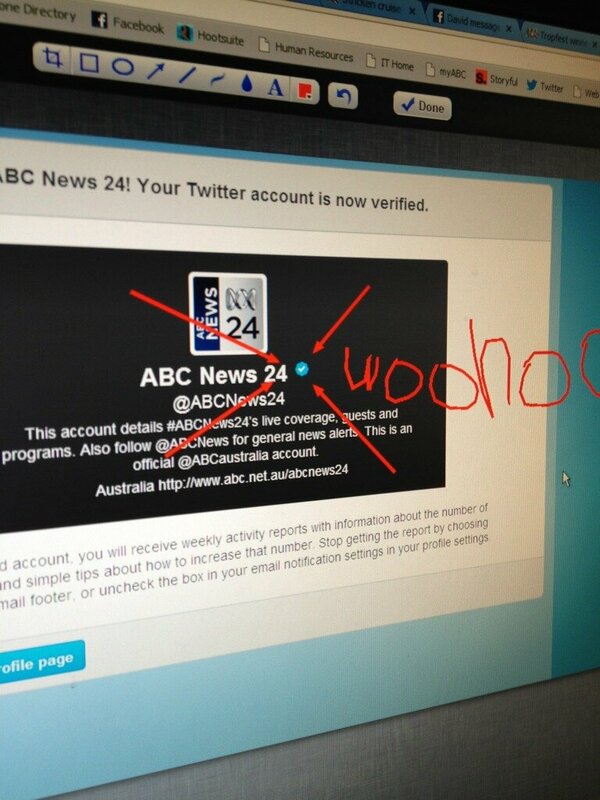 @abcnews24 OR #abcnews24 - a search to monitor what our audience is saying about the news channel I work for, ABC News 24. #NX lang:en - again, another search, this time to monitor tweets about our social media show News Exchange. I've applied a filter to find only tweets in English, as it's quite a common hashtag. Favourites - I use it as a way to flag content (mainly longer articles) I'd like to read later or keep a record of. Download Tweetdeck as a Chrome app here. One of the first checks I do with images when verifying for broadcast is a reverse image search. In other words, instead of conducting a search for an image, I upload the image to a search engine to see if the image exists already elsewhere. The thought process being that if someone has just taken a photo of a freak storm, it shouldn't be elsewhere on the internet. It should be new content. Google's Image Search made this super easy. You literally had to drag the picture file into the search field, and Google would look for that image on the web, or like images. Now, that process got easier with a new Chrome extension, Search by Image (thanks Gary Kemble for the tipoff about this). This allows you to right click an image - on a Twitter page, on a Facebook profile, wherever - and select 'Search Google with this image'. Download the Search by Image extension here. Website in another language? Never fear, Google Translate is here! While it's not word perfect, and can't translate written text embedded in images, it gives you enough to add to other checks when gauging the authenticity of content. Download Google Translate for Chrome here. Props to my colleague Alex Lee for putting me onto this one. Awesome Screenshot is a quick way to grab a screenshot of anything in your web browser. As a journalist, a very useful tool for getting a record of sensitive content before it might be deleted. And you can annotate screenshots too - Alex Lee again gets kudos for this artwork. As the name implies, say farewell to ads on websites. Do you need another reason? Over to you. If you use Chrome, I'd love to hear what extensions and apps do you use daily. Or what web tools help you in your job? Share in the comments below. Talk about going live under pressure. Sky News UK reporter and Asia correspondent Mark Stone recently broadcast live from China....right as police were detaining him and his crew, for what he claims was language used in reporting referencing the 1989 Tiananmen Square protests. Stone says police were seemingly unaware of exactly what was going on thanks to the size of their broadcast kit. "What they don't realise I don't think that this is to you now in London, and they think this is something we're doing for later, which is why for now, we're being allowed to film..."
As TVNewser described it, incredibly compelling footage. Very much hope that @stone_skynews is ok. Although I also hope that the Jessie Jay mobile ringtone isn't his! If you work in news, you'll know that moment when news breaks and an editor or someone calls out to you 'Quick, what's Twitter doing??' and you throw yourself at your keyboard, hurriedly trying to find the best content quickly. If you've tried to do this using Twitter's search page in its most basic form, you'll know that the process can be quite frustrating. But what a lot of people aren't aware of is a powerful set of search operators you can use to quickly hone your search based on geography, timeliness and content. The following is based on Twitter's search tips here. Pretty simple, right? With only a few operators, you can hone your search incredibly quickly. 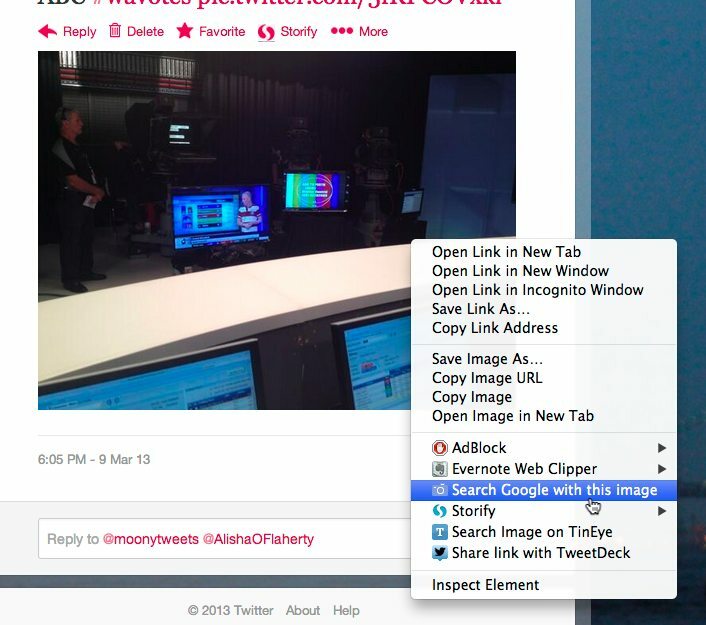 Use filter:links when searching for visual content (images, videos) from the scene. This operator will only pull up tweets with URLs in them. Here's where the fun REALLY starts. Let's have a look at some practical examples. Scenario: A train has crashed into a railway station in the Brisbane suburb of Cleveland (True event). Cleveland near:Brisbane filter:links – this will bring tweets sent near Brisbane that contain the word Cleveland and contain links. “engine fault” lang:en since:2013-02-01 filter:links – This would pull up any tweets containing the phrase “engine fault”, sent since 1st February this year, in English and containing links. This is where Tweetdeck as a management tool for Twitter on your desktop really comes into its own. Either in the web version, or in the latest desktop version, simply put your search exactly as you wrote it, including operators, into Tweetdeck's search bar, then hit Add Column. Voila, your search now becomes a constantly refreshing column, alerting you when new content is posted. This is another way to build a column in Tweetdeck if you don't want to use a list, especially if you're working at speed. For example, you might quickly want to build a search pulling in tweets from a series of news accounts around a certain search term. israel from:abcnews OR from:bbcbreaking OR from:reuters - This would pull in any tweets from these three accounts (note you don't put the @ in) containing the word Israel. Still want more? 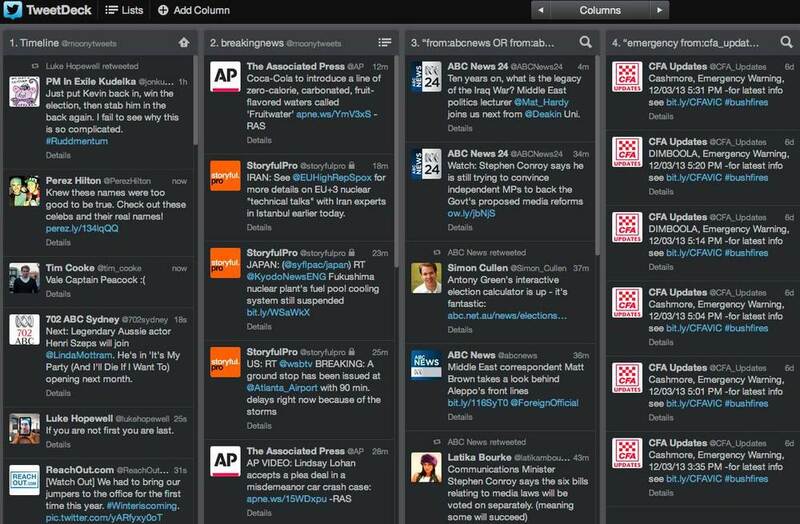 For Tweetdeck geeks, I also recommend this detailed guide by Storyful's Felim McMahon. Have I missed anything? Questions? Got more Twitter search tips? Drop them in the comments below. SIMON PALAN: The independent senator Nick Xenephon is being detained in Kuala Lumpur airport. He's been deemed a security risk there. Now Nick Xenephon is with us now on the phone.What can you tell us? NICK XENOPHON: Well not much. I arrived in Kuala Lumpur about 2.5 hours ago, ahead of a delegation of MPs from Australia. Dr Mal Washer and Senator John Williams to look at the Malaysian electoral system. We had a meeting lined up with one of the senior Government ministers from Malaysia as well as the Opposition Leader Ibrahim and had been invited by the clean and free and fair elections movement. I got into immigration about 2.5 hours ago. I was told that there was ago. I was told that there was a problem, some technical glitch. The tech - technical glitch turned into something else. I was escorted to another area and told the wait and after 30 minute was taken to another area where people were being detained. I saw a number of women in cells in the room adjoining me. I was then told that they had orders from above that they had orders from above that I was a security risk and I had to be deported. So are you being detained at the moment and how are you able to speak to us on the phone if that's the case? Well, apparently I'm not supposed to use the phone but no-one has stopped me yet so I guess the worse they can do the deport me. From your understanding you're being detained not because of anything that has upset Malaysian authorities since your arrival, you were detained immediately on arrival? I was detained immediately on arrival. Presumably it's because of some of the things I've said in the Australian Parliament about the state of democracy in Malaysia. I can't leave this area, I had to ask for permission to go to the bathroom and I had to be accompanied by an armed guard earlier on so that's what the state of play is. Look, Malaysia is due to have elections here very soon. I think the Australian Government has been incredibly silent about some of the abuses that have been occurring here in terms of the way the democratic system runs or doesn't run. And what we were trying to ascertain with members of both the Coalition and the Government was to how free and fair the elections are likely to be but at this stage I've been told that I'm not allowed entry and I have to be on the next flight back home. OK, were you expecting to be detained upon arrival? Did you think that was a chance? Not at all. I just find it extraordinary. I've been here before, I've made statements about the state of Malaysian democracy previously but on this occasion clearly someone high up in the Malaysian Government doesn't want me here, although the paradox is that we were due to meet with one of the most senior ministers who is responsible for the electoral process on Tuesday morning as well as the Electoral Commission so it's as though I'm a security risk not to be allowed into the country but I wasn't deemed a security risk to meet one of the most senior ministers in the Malaysian Government. Do you expect to be deported now? I've been told that's what will happen. Australia's High Commissioner to Australia is on his way to the airport. Hopefully he will be able to get access to me in the secure area and we'll wait and see what happens. And have you spoken to any Australian officials at this stage? Apart from the High Commissioner, the High Commissioner was good enough to ring me and I'm just waiting to hopefully he will be allowed access to meet with me. OK, and Senator, just give us a run down of how exactly you became involved in this cause? Well, I became involved in this cause when the Opposition Leader Ibrahim came to Australia in 2010. He met with a number of MPs. I undertook to keep an eye on the trial he was facing which he was subsequently acquitted of. In January last year I was there for that trial as observer. I was part of an observer. I was part of an observer group that looked into the election system that published a report at the end of April last year and I had - and I am pursuing a defamation case including criminal defamation against basically State or government-backed media organisations for things that they've said about me basically misattributing a speech I gave on scientology and replace ing scientology with the word Islam which was pretty rough stuff. So I'm just here to - I was waiting to meet with my colleagues as part of a delegation to look at the Malaysian election system but right now I've been told that I must be deported as soon as possible. OK. Do you feel safe? I Feen mean how are they treating you? They're apologetic. They're saying this is something that is beyond their control. The immigration officials I've spoken to have all been incredibly polite but they say they have orders from above that I'm on a watch list which means that I can't be allowed into the country. I understand there are some other Australian politicians who are headed towards Malaysia on thesame cause, do you think that they will not come now? Well, possibly not. I've managed to get through to Senator John Williams who was due to fly out to get here in the early hours of Monday morning. Dr Mal Washer was due to get here tomorrow night and Steve Giorganis, the Labor member for Hindmarsh is due to arrive tomorrow afternoon. What the status of that is now is anyone's guess. Do you have anyreflections on the state of democracy in Malaysia given your detention? Well, unfortunately confirmed some of the fears that I've had that have been reflected upon by those I've spoken to including the elections movement of Malaysia and the whole thing is rather bizarre and surreal but it's already been a long night for me and I'll just hopefully I'll get some idea of what's happening sooner rather thanlater. How long have you been at the airport? It's approaching 3 hours now and after getting off an overnight flight, and I need to let your viewers know I do fly economy to save money. Nick Xenephon,thanks for speaking to us in trying circumstances. Appreciate it. For the 80th birthday of the Australian Broadcasting Corporation, we asked our viewers to share their favourite memories, and I used Storify, where possible, to track down archival footage related to these posts. It's a skill admired by many, practiced by some, but truly mastered by only a few. Andrew Moon looks at the art of writing and delivering a killer speech. US President Barack Obama this month opened a monument on the country’s National Mall in Washington DC to the first American not to have changed the country through public office, but through his words. Late on a summer afternoon in the nation’s capital in 1963, clergyman and civil rights leader Dr Martin Luther King delivered four words - I have a dream - over and over, each time chipping away at a stone wall dividing a United States. “Because of that hopeful vision, because of Dr. King’s moral imagination, barricades began to fall and bigotry began to fade,” President Obama said. The 44th US President is himself regarded as a ‘grand orator’, captivating audiences worldwide with his hope-infused rhetoric. But sometimes, an audience may be a little less receptive to your chosen words. Sometimes, those words may be all you have to save you from imminent death. “I actually had to engage a room of about 40 boys in East Africa who had threatened to kill me,” the then 23-year old social entrepreneur says with a laugh, perhaps in hindsight. For Tait, speaking en masse is nothing new. At 18, he worked as a Junior Officer with the United Nations in a combat zone. At 25, he developed an orphanage in Kenya. Along with wife Kaitlin, he has now founded Spark* International, encouraging leadership development in some of the poorest countries in the world. But Tait’s close call in a slum school in Tanzania reinforced a golden rule of public speaking: know your audience, and treat them with respect. “Who is this person and why am I listening to them? Any audience wants to know that. And also respectability. Does this person respect me, and am I going to give them respect back?” he says. But how do you prove you’re the real deal to get the crowd on side quick smart? The devil’s in the detail says not-for-profit founder Melissa Abu-Gazaleh. The 24-year-old from Wollongong on the NSW south coast has quite a few of those under her belt as she continues on her crusade to shed light on the positive ways in which young males are bringing change to their communities. “People believe the statistics and facts, and there’s really strong ones out there about young men,”she says. Each year, Abu-Gazaleh and her Top Blokes Foundation picks a handful of twenty-something males from the Illawarra region, and mentors each in civil service skills and public speaking. To take out the final gong, the candidates must woo a crowd of sponsors and community leaders with a series of prepared and impromptu speeches. “I think what makes a great speech is about finding relevance to the audience, and trying to have that unique edge to it,” she says. It’s the magic P word, the final ingredient in the prize-winning speech pie. Passion. Speechwriter Dennis Glover says without it, your carefully crafted pars could turn out a little bland and uninspiring. In the world of the painstakingly prepared prose, Glover is somewhat of a Masterchef. For the best part of 15 years, he’s written speeches for former Labor leaders Kim Beazley, Simon Crean, Mark Latham and a number of senior figures in the Gillard government. But he says the current batch in Canberra are demonstrating what happens when you leave that all important ingredient out. “The problem is that we have a political culture... where you get to the top not by exciting an audience and winning over a political conference, but you get to the top by doing the numbers in the back room,” Glover says. It’s a far cry from inner-city Sydney in 1992, when the then Prime Minister Paul Keating admitted to a crowd of indigenous Australians that their country had ultimately failed them. With a few well constructed pars, he began the country on an achingly painful path to healing decades of dispossession and division. “I mean you think about the Redfern address. It really is a wonderful piece of classical rhetoric,” Glover says. Whether it be a political rally for thousands or a pep talk for two, Glover says the secret to delivering words that change the world ultimately comes down to the approach you take. “You have to learn the techniques, but you have to think of it as a form of poetry. As something that combines both the technical qualities but also the passion and the belief and the love of it,” he says.